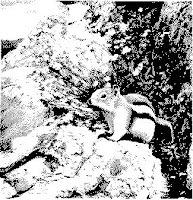 A Thought Shared ....: Why the chipmunk has stripes..
Chipmunk was awakened by the noise of falling crockery. Bear was taking his morning walk through the forest, and as usual was not happy, thumping the ground with each stride. Chipmunk poked his head out. "Bear, could you please walk more softly. You are disturbing my sleep." Bear looked over at Chipmunk and said in a very gruff voice "I am Bear, the strongest animal in the forest, and I can do anything I like." Chipmunk jumped down from his home, and approached Bear. "If you really are the strongest animal in the forest, and can do anything, then stop the sun from rising in the morning sky." Bear thought for a second, and agreed to take on the challenge. That night, Bear sat on a fallen log in front of Chipmunks home, eager to prove himself and his strength. The next morning, Chipmunk wasn't awakened by falling crockery. The reason this time was the sun's rays beating through the small window. Chipmunk jumped down from his home to taunt the sleeping Bear. "Bear couldn't do it, Bear couldn't do it. Hahahahaha. The sun has risen and Bear couldn't stop it." Bear awoke quickly and, turning on Chipmunk, held him to the ground with his paw. "I may not be able to stop the sun rising, but I can certainly make sure that you never ever see a sunrise again." Chipmunk was struggling to breathe and very afraid. "Bear, before you stop me from ever seeing the sunrise again, can I say a prayer?" Bear agreed to this. Chipmunk then asked if Bear could release the pressure a little so that he could say his prayer properly. Bear agreed. As soon as he could feel Bear release slightly, he struggled free and started to run off. Bear tried to stop Chipmunk, but only managed to graze the chipmunks back. To this day, the chipmunk has stripes on its back to remind all other forest animals never to mock those less smart and less quick than oneself.